PC users need not apply; eco-friendly ColcaSac bags are made with Mac users in mind. Each ColcaSac is hand-made in Salt Lake City, Utah from sustainable, natural materials from all around the world. These materials include hand-loomed cotton canvas from a small Mexican village, natural hemp from the valleys of China, and burlap. 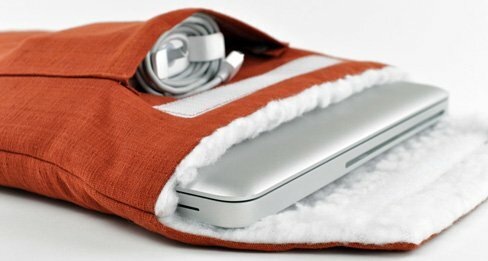 ColcaSac has all of your Mac needs covered, with sleeves for your MacBook, iPad, and iPhone. Even tech-savvy readers get a look in with the new Kindle sleeves. I can't help wishing for a shoulder strap to make the MacBook sleeves easier to manage, but at least the pouches protect your precious technology, and keep the planet green. ColcaSac is so committed to green efforts that it's a member of 1% For the Planet. Through this organization, the brand donates one percent of its sales to eco-friendly causes. Through the charity the brand has adopted rainforest land in Costa Rica to help protect the country’s precious flora and fauna for the last three years. ColcaSac tech pouches are available from the label's online store and Supermarket.